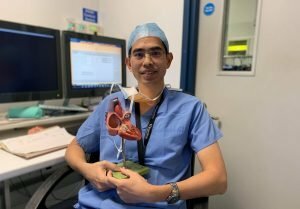 Dr Lim will be presenting an update on the latest guidelines for atrial fibrillation (AF) and syncope at the Cardiac Update Meeting in London on 11 April 2019. In this talk, Dr Lim will be speaking with healthcare professionals to discuss the latest developments and novel findings from the AF and syncope guidelines. A cardiac update meeting for healthcare professionals involved in the management and treatment of arrhythmias. 09:40How can digital technology help Detect Protect Correct – which ECG is best for your patient? Dr Lim is an experienced Consultant Cardiologist and Electrophysiologist. He is the clinical lead for the nationally-renowned Imperial Syncope Diagnostic Service based at Hammersmith Hospital London. Dr. Lim is an experienced Consultant Cardiologist and Electrophysiologist. He is the clinical lead for the nationally-renowned Imperial Syncope Diagnostic Service based at Hammersmith Hospital London.